Calise Hawkins, Julia Johns and Scott Chaplain weren’t planning to dive into a typical stand-up routine when they took the stage at WFMU in Jersey City, New Jersey, on Oct. 21. Surrounded by a 1970s-themed set, the comedians were set to riff on a topic that doesn’t seem like much of a laughing matter: the state’s governor’s race. The jokes were intended to raise awareness about a governor’s election that has drawn little enthusiasm from New Jerseyans, despite the importance of the role for the state. It’s the first time in 12 years that New Jersey will elect a governor without an incumbent on the ballot and is one of only two gubernatorial races this year, along with Virginia. Yet, according to a Quinnipiac University poll in September, about 40 percent of likely voters didn’t know much about either of the main candidates: Democrat Phil Murphy and Republican Kim Guadagno, currently the lieutenant governor under Chris Christie. After a turbulent administration wracked by scandal and a failed presidential bid, Christie is leaving office with a 14 percent approval rating, making him the least popular governor in the state’s history. To help the public get to know the gubernatorial candidates better, CIR, WFMU and the Center for Cooperative Media commissioned Firestone to conceptualize a comedic game show drawing from facts and issues at the core of the election. Firestone devised Electorama as a dating show to spotlight the candidates’ platforms. It worked like this: Hawkins, Chaplain and Johns each asked questions of people playing the parts of Murphy and Guadagno – Bryce Kretschmann and Kim Nolan, respectively. The schtick was to pretend the candidates were potential suitors trying to woo the comedians’ votes. The “candidates” were limited to responding with actual quotes from the real candidates during the campaign. CIR and the Center for Cooperative Media compiled the quotes ahead of time on topics ranging from gun control to marijuana legalization. “We can make New Jersey affordable again by cutting the property taxes,” Nolan answered in a sing-song voice, delivering a comment Guadagno made to NJ Advance Media in May. Guadagno’s campaign has been laser-focused on a plan to cut property taxes, standing in stark contrast with Murphy’s proposal to increase income taxes on New Jersey’s wealthiest. It’s one of several key issues at top of mind for voters, along with job growth, marijuana legalization, immigration and the state’s public pension crisis. To raise the specter of the outgoing administration, 10-year-old Charles Robinson played Christie as a third “mystery candidate.” Charles took the stage in a beach chair, outfitted in a bathing suit and T-shirt to mimic the infamous aerial photo taken by NJ Advance Media of the governor with his family on a beach he had closed to the public during a government shutdown. The night also was peppered with trivia questions read by Bernie Wagenblast, a transportation reporter whose voice can be heard on New York City subways and AirTrain announcements. A crowd favorite, Wagenblast challenged the audience to answer questions about the gubernatorial candidates and New Jersey for prizes. The game ultimately ended in a draw, with the comedians going three separate ways: Hawkins chose to vote for Murphy, Chaplain sided with Guadagno and Johns asked to write in a vote for Wagenblast. This year, the Center for Cooperative Media and CIR have coordinated Voting Block, a reporting collaboration among newsrooms in New Jersey that has tapped into election-related concerns from neighborhoods around the state. More than 20 newsrooms are convening conversations and reporting stories that highlight voters’ priorities. As part of Voting Block, partners have launched opportunities for the public to participate in the reporting and spark discussion about the election. New Jerseyans were encouraged to host potlucks with their neighbors and follow a politically themed discussion guide, submit questions they had for the gubernatorial candidates, and share their priorities for the next governor through a text message campaign. Electorama was another experiment to creatively engage voters, drawing on themes we heard during our Voting Block reporting through the comedians’ questions and quotes we selected for the candidates. 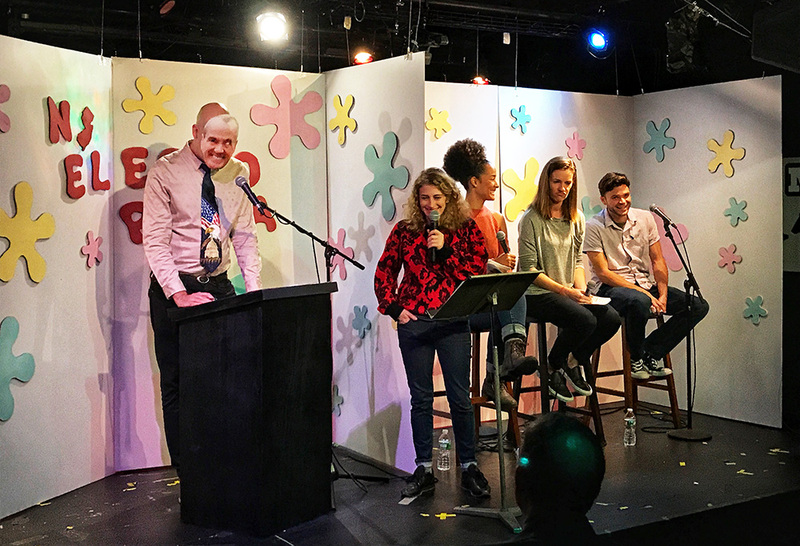 It was also the second comedy-meets-journalism event hosted by CIR and WFMU, building on last year’s Toxic Comedy World Tour that commissioned comedians, including Firestone, to muse on reporting by newsrooms in the Dirty Little Secrets collaboration on toxic contamination. You can watch a recording from Electorama below.